Vision Source – Orland Park offers many options for contact lenses. There are a number of reasons why you might prefer contact lenses to traditional eyewear: a glasses-free look, hassle-free vision correction, wearing non-prescription sunwear and goggles, or the convenience of not having to worry about misplacing your glasses. If you have a high prescription or astigmatism, contact lenses may provide more enhanced vision correction than glasses. Today, you can even replace your bifocal glasses with bifocal contact lenses. Our eye doctors can recommend the best contact lenses for you based on a complete eye examination and a review of your visual needs both at work and play. Since most people can wear more than one type of lens, it’s important to know what the choices are and the advantages and disadvantages to each. 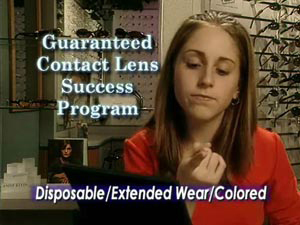 To ensure your complete satisfaction, we offer our GUARANTEED CONTACT LENS SUCCESS PROGRAM. If you’re not completely happy with your contact lenses, return them for a full refund (professional fees are not included). If you’re interested in learning more about contact lenses, ask us about our FREE contact lens consultation (does not include actual fitting). These lenses are comfortable to wear and must be replaced monthly, weekly or daily depending on the type selected for you. Soft lenses are often recommended for sports because they fit closer to the eye and are more difficult to dislodge. They can provide correction for most prescriptions including astigmatism. Today, with the introduction of newer materials like silicone hydrogels, which allow more oxygen to the eye, patients find it easier than ever to wear soft lenses comfortably. Made of Oxygen permeable polymer, GP lenses offer very sharp vision and correct most vision conditions. They are more durable than soft contact lenses and can be easier to handle and care for but require a longer adaptation period and consistent wear to maintain adaptation. Our doctors are highly skilled in the fitting, prescribing and trouble shooting of GP contact lenses. If you’re holding your book, menu, newspaper or any other reading materials farther away in order to read, it may be time to treat yourself to clearer more comfortable vision. Your reading difficulties don’t mean you have to change your lifestyle or your appearance. If you currently wear single-vision contact lenses for distance, there’s no reason to give up the freedom you enjoy with contact lenses. And if you currently wear glasses and shudder at the thought of wearing tell-tale bifocals, our bifocal contact lenses may be the answer for you. Silicone hydrogels are a newer generation of soft contact lenses that have high oxygen permeability comparable to GP lenses. Regardless of the type of contact lenses you wear, an annual eye exam is recommended to ensure the continued good health of your eyes. Schedule an appointment for an assessment and professional advice at Vision Source – Orland Park. Copyright © 2019 Vision Source - Orland Park. All rights reserved.